Greetings, forex friends! The minutes for the April FOMC meeting got released yesterday, and the Greenback reacted by spiking higher. What gives? Well, let’s take a closer look at the details of the FOMC meeting minutes, shall we? According to the FOMC meeting minutes, a “few participants” wanted a rate hike in April. In contrast, only a “couple of participants” were calling for a rate hike during the March FOMC meeting. 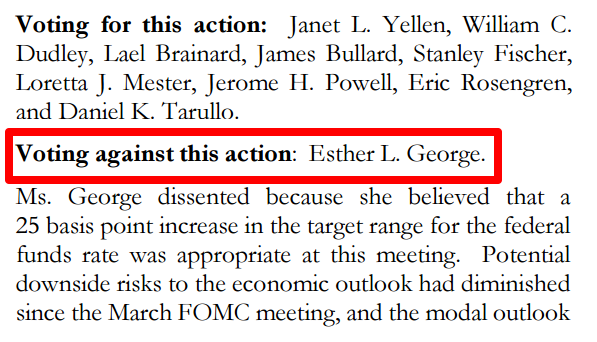 However, most of these participant probably weren’t voting FOMC members because only Kansas City Fed President Esther L. George voted for a rate hike then and there. Also worth noting is that a “couple of participants” were worried that delaying another rate hike “might confuse the public about the economic considerations that influence the Committee’s policy decisions and potentially erode the Committee’s credibility.” In simpler terms, these FOMC members were worried that the market would lose confidence in the Fed, and by extension, the U.S. banking system as a whole. Also, “some members expressed concern that the likelihood implied by market pricing that the Committee would increase the target range for the federal funds rate at the June meeting might be unduly low.” In plain vanilla English, some Fed officials were worried that the market is betting heavily that a June rate hike is likely not in the cards, which further highlights the Fed’s desire not to lose credibility. In terms of specifics, “some participants” expressed their concerns on the possible impact of the Brexit referendum on global financial markets, as well as China’s manipulation, er, I meant to say management of its currency. It is interesting to note that “several” Fed officials were worried about “vulnerabilities in the financial system,” as the FOMC meeting minutes puts it, which includes “rapidly rising prices” of commercial real estate and the lack of liquidity of some mutual funds (among others). Hmm. The Fed is not expecting any financial stability problems but discussed the possibility of using monetary policy to address financial stability risk and also wants to incorporate financial stability in future monetary policy decisions. Kinda weird, if you ask me. There were also some rather disconcerting talks about needing to hike rates in order not to lose credibility and rhetoric that there are no major financial stability risks while talking about using monetary policy to address financial stability risk, but these were apparently just shrugged off by the market.